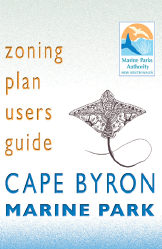 Click the picture of the cover to download the Cape Byron Marine Park user guide. 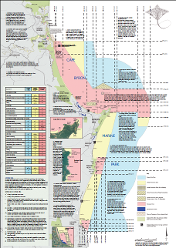 Click the picture to download the Cape Byron Marine Park user map. Click the Logo to Visit Sundive Byron Bay website. Julian rocks is situated within the Cape Byron Marine park in northern NSW. 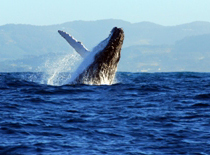 It is home to over 1000 marine species including wobbegongs, rays, turtles, fish, nudibranchs and many more. 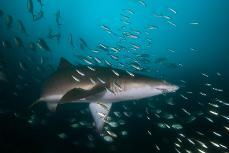 It is an aggregation site for the endangered Grey Nurse Sharks, Carcharias taurus, who visit in winter. Leopard sharks visit over summer. This is where warm and cool waters meet, hence the enormous biodiversity. A minority of species are endemic to this area. Most are found over a wide area of the Asia-Pacific region. 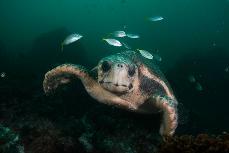 The best diving in Byron Bay is at the Julian Rocks themselves, with a good variety of dive sites available. Spot X and the Mackeral Boulder are locations visited occasionally, only in ideal conditions . 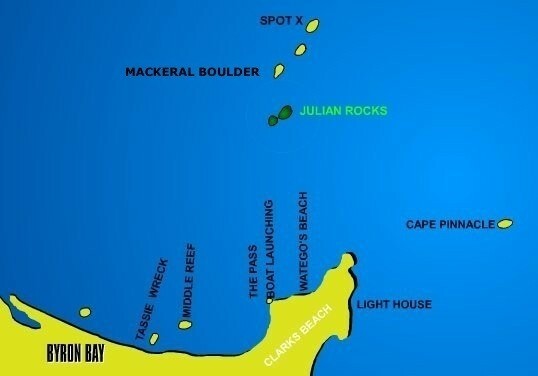 The Cape Pinnacle is a deep site 40m + and suitable for whole boat charters for Deep Certified divers only. The Tassie Wreck and Middle Reef are good snorkelling sites but a little shallow for scuba. Click on the Logo below to visit Blue Bay Divers at Brunswick Heads (Just north of Byron Bay). A great option for avoiding the crowds and backpackers of the Bay. Click on the pic to visit the website to check out the dive boat - a much easier proposition to the surf entries on the beach at Byron Bay. Click here to read why Blue Bay Divers may be a better alternative for you. One of Grant's favourite sites at Byron, however, it is not regularly visited. 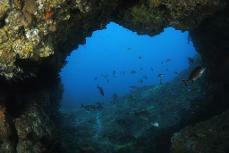 A large circular rocky reef with the best diving at around 35 m. Can be fully circumnavigated in a dive. The surface of the Pinn includes undercuts and ledges with rich and colourful invertebrate growth and local species unique to this site. Large fish such as jewfish, cobia, cod grouper and kingfish are frequently sighted as are several types of rays and big wobbegong sharks. 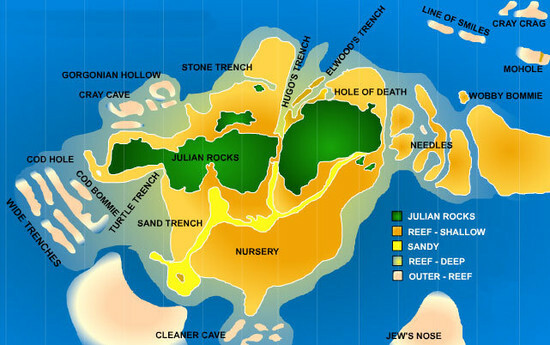 Visibility is similar to Julian Rocks. A spectacular and memorable site featuring an outcrop resembling an underwater Ayer's Rock (Uluru). The rocky outcrop is enormous with big gullies and huge shelves. The size is best appreciated when the visibility is good. This site is 14km from land and is very close to the edge of the continental shelf and really deep water, visibility is therefore often very good. A wild and 'remote' place site, divers can expect to Tiger, Hammerhead, Whaler and Grey Nurse sharks. 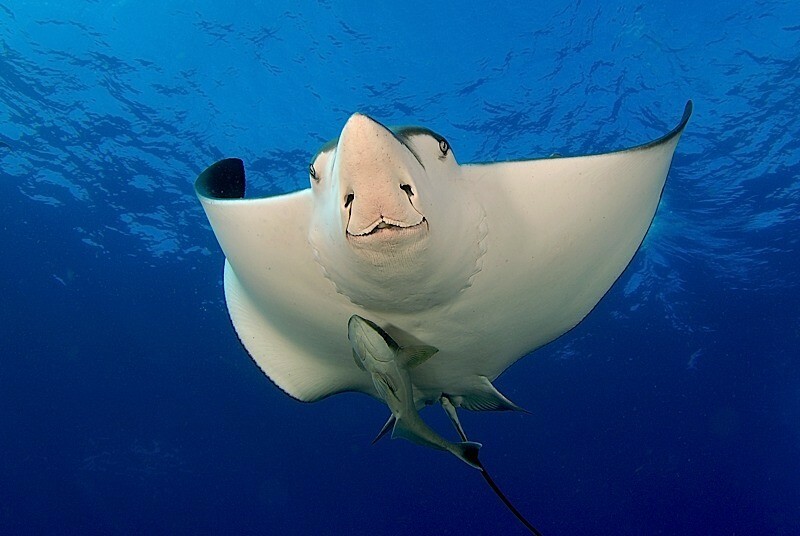 Schools of large pelagic and rays are typically seen diving here. The current is variable and influences the ability to be able to dive here - similar to Pimpernel Rock off Wooli further south. Suitable only for those with significant current deep skills. Features large bommies creating a series of intersecting gullies. The central gully is home to a huge column of damselfish species where most of the action occurs. Also expect basket stars black corals , some small gorgonians and a few small caves and crevices under rocks home to an odd Maori cod or two. The bottom is home to large wobbegong sharks. 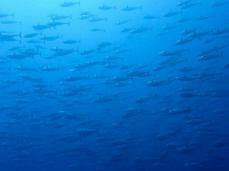 Large pelagic fish such as yellowtail kingfish, jewfish and large rays can be seen gliding by. This is an excellent site for casual, relaxed and easy shallow diving with a mixture of big marine life sightings. The boulder pile is split by numerous deep and undercut fissures for interesting exploration. At the north western corner there are numerous holes, caves and fissures where divers can often see large cod, wobbegong sharks, loggerhead turtles and painted crayfish. 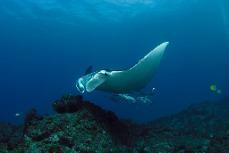 In the cooler months there are occasional sightings of enormous smooth rays with a diameter of over 3m. Large pelagic visitors include jewfish, kingfish, snapper and mackerel. 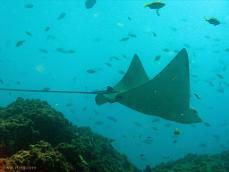 Also expect to see spotted eagle rays , white lined black stingrays and blue spotted stingrays. JULIAN ROCKS DIVE SITES Over many visits Grant has dived right around the 'Rocks'. It is a wonderful, colourful site and only minutes from shore! The COD HOLE is a sloping archway, 14m at the shallow entrance and 15-18m on the deeper side. Inside there is normally a large school of bullseye. Jewfish, large cod, kingfish, Queensland groper and grey nurse sharks may also be seen inside the shelter. Inside, the walls divers can see painted crayfish, slipper lobsters, coral cod, moray eels of several colours, cleaner shrimp and if you're really lucky the rare ornate ghost pipefish. Nearby is the COD BOMMIE and the WIDE TRENCHES. If a north/south current is running, large fish gather in front of this bommie including Queensland groper. It is common to see several grey nurse sharks together during winter months in the nearby sand area. Diving is normally conducted so that divers drift along with the current when it is running. Also adjacent to the COD HOLE is a deep sand trench - TURTLE TRENCH, where fish shelter in large numbers from the current. 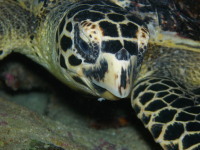 It is also home to up to four species of turtle. This is the main mooring area protected from the prevailing sea swells which are typically from the South East. 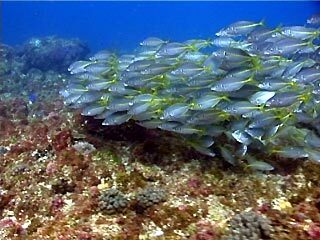 The depth is ideal for the younger Junior Open Water divers and is mostly rocky reef with some sand trenches. 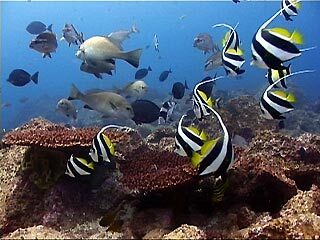 It is particularly rich in small fish and invertebrates with many sea anemones and clown fish. At the SPLIT BOMMIE there are schools of fish including black spot goatfish, starry toadfish, pomfreds and bullseyes and sometimes crayfish. 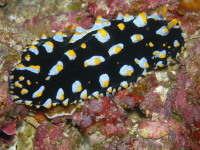 There are beautiful egg cowry shells, many varieties of sponges, ascidians, sea urchins and it is not unusual to see manta rays and other large fish. A large rocky area with a hollow underneath. Frequently visitors seen include loggerhead turtles, large banded wobbegong sharks, juvenile catfish, painted crayfish, slipper lobsters, cleaner shrimp of several types, black cod, blue groper, bullseyes, pomfreds, old wives, big eye soldier fish, red morwongs and gold spotted sweetlips. A small swim through archway. Home to large painted sweetlips, big blue tuskfish, Queensland groper, cuttlefish, crayfish, juvenile angel fish, large cod and Sometimes large banded wobbegong sharks. Just outside the are several deep fissures where the big fish may hide when not in the cave. 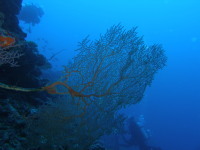 Nearby is the GORGONIAN HOLLOW, home to several coral species and where large loggerhead turtles, juvenile catfish and peacock soles and numb rays are frequent visitors. HUGO'S TRENCH is a steep walled chasm with a sandy bottom often filled with two species of wobbegong shark. 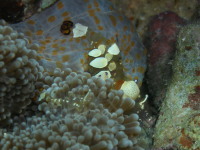 Peacock sole are common on the sandy floor. Schools of tailor, jewfish, bream and many other species hang in the trench. STONE TRENCH is a narrow passageway giving access to the EASTERN ESCARPMENT, THE BLACK CORALS with depths up to 24 meters. West of here is ELWOODS TRENCH named after a blue groper called Elwood after the Blues Brother. The NEEDLES comprise several large bommies with sand or rocky trenches between and can be subject to swell and or current, consequently it is generally home to clouds of fish both large and small. There are caves with crayfish, moray eels, turtles and several black corals in two colour forms. Spanish dancers are seen most commonly here. From here to the MOHOLE, THE CRAY CRAGS and the LINE OF SMILES the depth increases to 16 m. TheMOHOLE is a deep horizontal cave with loggerhead turtles, catfish wobbegongs, moray eels, lionfish and big schools of bronze bullseyes and yellow striped goatfish. A large bommie with a myriad of holes and caves, the CRAY CRAGS are home to cleaner shrimp, leaf scorpion fish, scorpion cod, crayfish, coral cod, black cod, starry toadfish and the passing snapper and kingfish. The LINE OF SMILES has one main slit cave lined with many small wobbegong sharks and blind sharks, crabs, shrimp and crayfish.